Earn $17.60 in VIP credit (1760 points)What's This? Chris King's legendary in-house fabrication makes for a Press Fit Bottom Bracket that's smoother and more durable than anything else on the market. They manufacture their own stainless-steel sealed bearings for exceptional quality control, and their angular contact design lets you adjust them as they wear for precision operation and longer life. 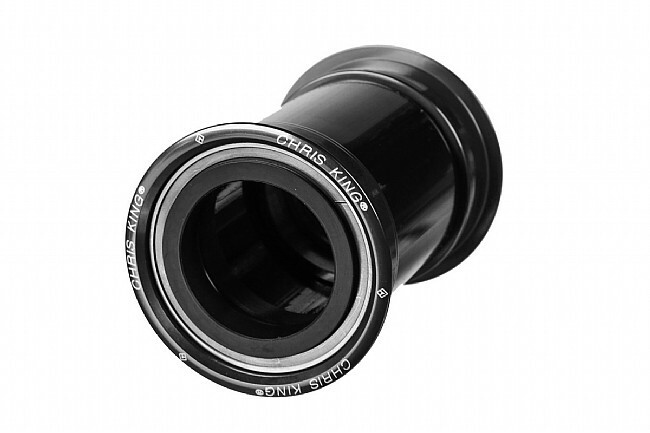 This 30 mm Press Fit Bottom Bracket fits PF30 frames only and will natively fit 30 mm spindles, but 24 mm / 22-24 mm cranks can be adapted using Chris King's Bottom Bracket Conversion Kits. Available in multiple colors. 5-year warranty. Claimed weight is 101.5 g.
With the bb30 and pf30 being infamous for it's creaking, I sought out internet reviews for a pf30 bottom bracket that didn't creak. This was the only one that had consistent reviews of it not creaking. There's something to be said when you don't have to worry about your bike and you can just focus on your ride. This bottom bracket it does that for me. A bit pricey, but you end up getting the quality you pay for in my opinion. I have been using this pf30 bb for more than 2 years. Smooth, and no creaking. It is awesome, end of story. A guide to bottom bracket standards.